Don’t we all love it when a plan works out! I’d say that about our last deer hunt. It was even more than the plan. Our plan, mine really, meaning I’ll take credit for it now where so much went well , was forged right after opening weekend the year before. We would again not hunt hard, but smart. Items out of our control, the draw and the weather, certainly worked in our favor. We got 1st choice in the draw, and a long enough period without rain. So we would wait, each of us at a waterhole. Minor problems at first. The one Steve had selected in pre-season scouting had been taken over by cattle. And when Ron got to his, a Quad was already parked there. It pays to be super early. But we had done our homework, and both could divert to different waterholes. I got to mine way early without issue. My very primitive blind did allow observing the entire waterhole, and for the most part provided shade all day long. So we were set for, or rather we were sitting on opening day. Except, no deer showed up. OK, Steve could have tried a shot at a spike which never stopped. But he held his fire. 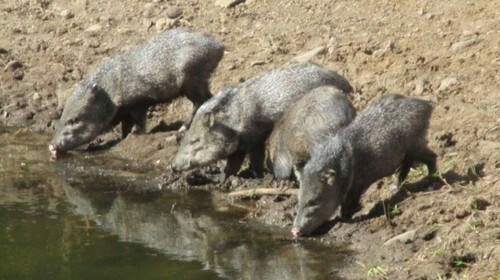 I had entertainment twice, courtesy of javelina. That is the downside to hunting a waterhole. You have to stay put, keep your movements to an absolute minimum, and definitely at slow motion. The scenery never changes. It will get boring unless critters come and visit. Dozens of little song birds provided occasional entertainment. It is an exercise in faith; in believing that a buck will come in. Much more so when after 12 hours in the same spot not a single deer showed up. Of course such days provide plenty of opportunity to ponder, about things a typical day would just crowd out. 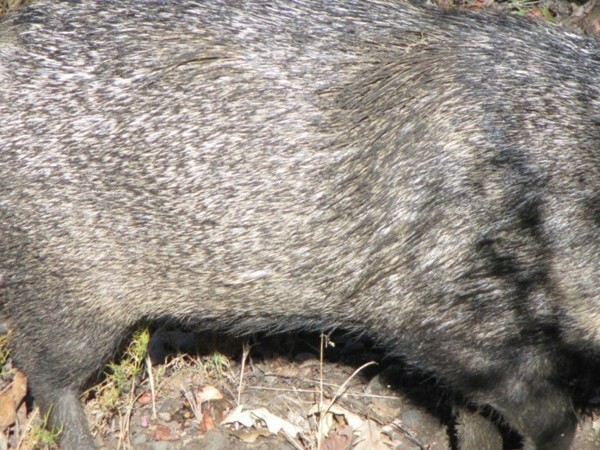 The javelina never knew I was within as little as 20 yards of them. 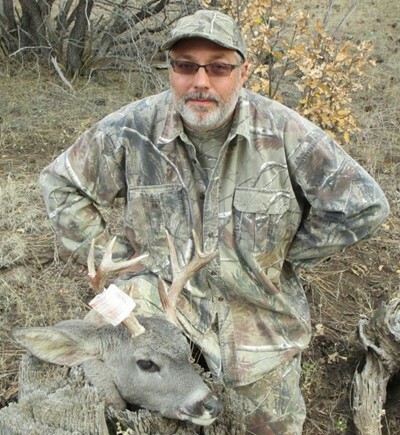 Steve got rewarded the second day when he dropped a forked horn with his .308 Tikka. By the time I got back to camp that buck was already skinned and hanging (no picture). Ron only saw turkeys at his. For me …, well, first some other guy in his quad showed up around 7AM. About an hour later, a loud blowing sound not ten steps away scared the snot out of me. All I could see through heavy brush was an erect white tail departing with haste. That deer had moved in in exactly the one place where I could not have seen it prior to reaching the fence shown in the picture above. What to do after having been made in my hiding place? Plus, I did not know if that deer was a buck. Applying logic, I opted to just stay put. Yes, that one deer was onto me, but it can’t communicate to others what it had learned. Or could it? I could have poked this pig with my gun barrel. Back to that deer. Darn it, about two hours later the beast sounded another alarm, this time a little further up the hill and not visible by me. And later, yet a third time. Like it tried all it could to warn the entire deer population. And around sunset once more. I needed another plan! Instead of waiting it out until total dark like the first day, I moved from my makeshift blind to a cluster of arm-thick junipers from where I could see the hillside where the smartass deer had spewed its alarms. Of course it did not show up again by the time darkness had robbed all shooting light. Day three, Sunday, I again arrived in darkness. Each morning the moon had been losing size, reducing ambient light. It’s a little adventure in itself to walk under such conditions without flashlight. I just did my best to not announce my presence. Not wanting a repeat performance from day two, I opted to sit by that cluster of junipers. It was a lousy place, with a good quarter of the waterline not visible, and later looking into the sun. Again without using a flashlight I trimmed out a few lower branches with my folding saw to gain lanes of fire from this new ambush (hopefully) site. Would those junipers break up my outline enough? To the sides and back I was now totally exposed. That meant no or very, very slow movements. As daylight slowly increased I broke off small kicker branches which were not visible an hour before. There was one more time, I thought, to stand and stretch before committing to the chair for hours. Standing, none of the firing lanes were open. Sure enough, a deer popped up just then, right from that area I could no longer watch. But she was a muley doe. So I used the opportunity to pretend. She did not make me as I transitioned so very slowly into the chair. But with hands on the rifle, and by no means yet pointed at her, she had her fill of water and departed swiftly. Had she been a whitetail buck, I would have cried a river. 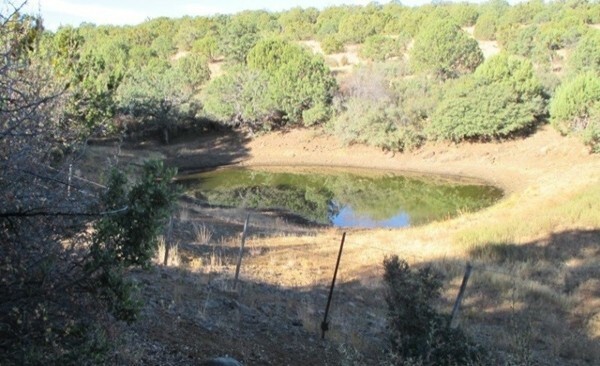 Apparently deer do not like to hang around waterholes more than needed. Lesson learned. From then on I sat, with .308 in hands. Good thing, because within an hour he showed up. 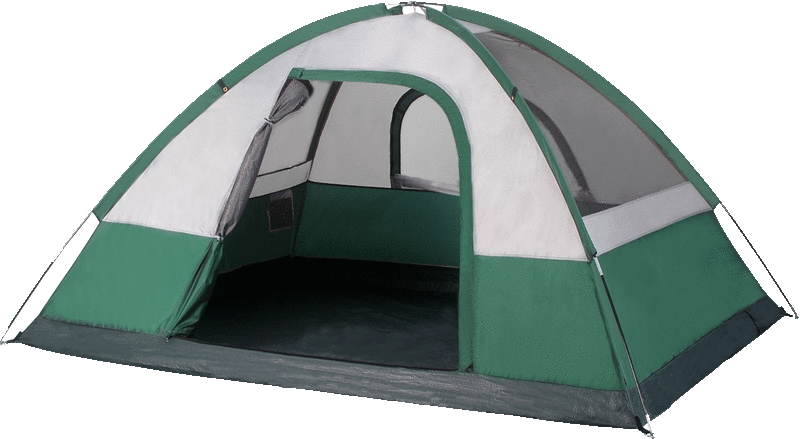 And I should have been in my original makeshift blind from the first two days. It would have been an open shot from there. Now all those junipers were in my way. Oh so slowly the Tikka came to my shoulder. Its canned barrel gently poked into one of the lanes. Now the crosshairs were on him. But he took a few steps. Not good, because the next tree would limit my ability to stay with him. The gun tracked, the crosshairs were in the right place – then that little extra pressure! >TscherrWhoap!< That in itself, hunting deer with a suppressor, was a new and very positive experience for me. With utmost delight did I notice insignificant muzzle bark but tremendous kugelschlag, the impact noise of the bullet hitting its target. 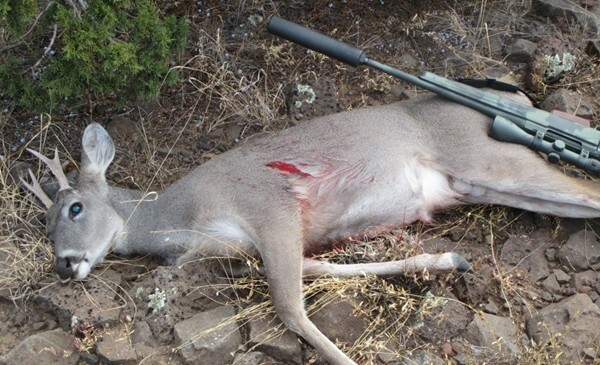 Hunting with a suppressor is ear candy, awesome! Hitting that buck sounded louder than the .308 discharging. As the red work later revealed, my Sierra 150 gr. SPBT centered a rib on the way in, shredded half the heart, fractured two ribs on the way out and broke the offside leg bone above the ‘elbow’. Exit wound exceeded fist-size. Oddly enough, below the bullet entrance four ribs had also fractured near the sternum. From the hydrodynamic pressure? Anyway, with that much damage the buck would just drop in its tracks, right? Not so. He bolted forward with near top speed. But rapid front leg stumbling made clear that something was very wrong. No need to cycle in another round. After about 15 steps he collapsed. I had what I came for, and thanked God for it all. Ron now had several waterholes to choose from. We recommended the one Steve had been at, simply because another buck had already visited it once before (the spike Steve had seen on opening day). Plus, its blind was the best of all we had installed. To make it quick, on day 3 one lone doe visited. On day 4 he saw javelina only. Ditto on day 5. Frustrated, he wanted a change of scenery for day 6. But when he got to my waterhole, someone had beat him to it – again. So he got to Steve’s late. Around noon, however, all was forgotten. Tired of waiting he dropped a fine buck with his .30-06 Tikka from over 150 steps away. That was one unforgettable whitetail deer hunt. We all tagged a buck. And yes, it is entirely my fault that Steve and Ron also hunt with a Tikka. The weather was perfect. Our camp had lots of luxury (thanks to Steve and Ron having brought in creature comforts, as I again did only the Motel Toyota thing). There was plenty of space for all, even a perfect tree to hang a deer in. Few other hunters drove by. Food was great. The campfire smoke even went straight up. The deer each cooled out perfectly overnight. We had morning frost. Now, Ron will argue that things could have happened a little sooner for him, maybe. But I said “unforgettable”, not “unbeatable”. We will certainly put in for the same choices next year. And I will never know if the buck I killed was the deer that frustrated me four times the day before. If it was, does that mean he forgot overnight about the great lurking danger? May hunting always contain plenty of mystery.